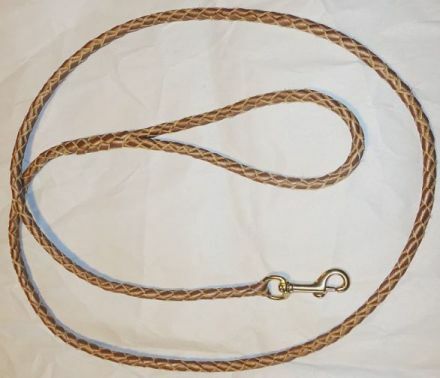 For about thirty years now I’ve been using four-strand braids to create leather goods such as dog leashes, horse reins, hatbands and key fobs. 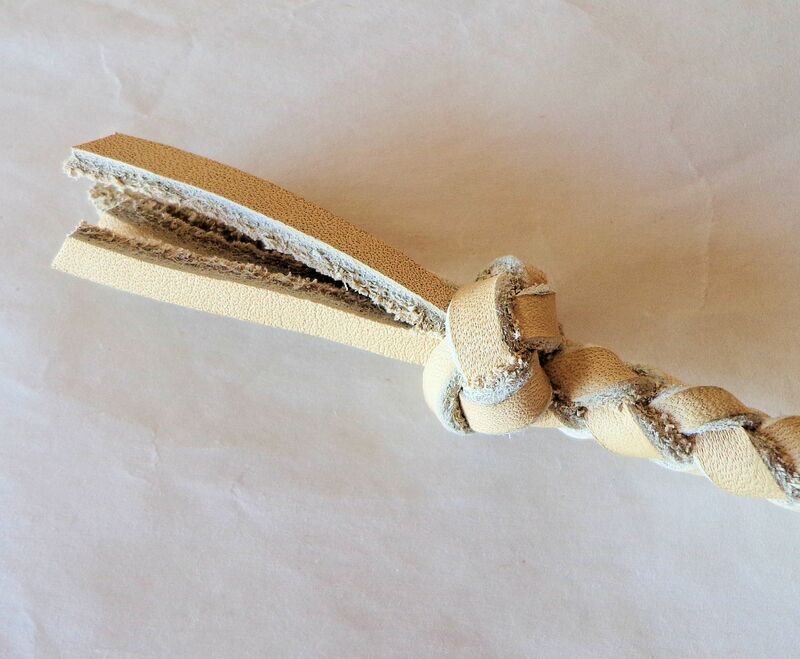 The four thong braid technique produces a round length of leather cord that is strong, flexible and durable. I learned to do this braid from an old cowboy. Braiding leather for use in horse tack is an ancient art. Braids can be made incorporating up to twelve thin leather strips. There are so many different types of knots (each with its own colorful name) possible to be tied that whole books are written on this skill alone. I usually stick to a four-thong braid and a simple Turks Head Terminal knot in my work. Using thongs of two different colors results in a pretty variegated item that is popular. The craft of braiding leather has been traced back to at least the Phoenicians though the Moors and then the Spaniards who brought it to the Americas with the men who cared for the horses. Leather crafting and particularly leather braiding is closely associated with those who keep horses and depend upon them to earn a living. The tack for controlling a horse is made mostly from leather. American cowboys and their more southerly counterparts, vaqueros and gauchos, were and still are often skilled in leather braiding. Therefore, it is not a surprise that an old cowboy should know the craft or that he would want to pass his knowledge on at the end of his life. With his patient tutelage, I quickly learned the basics of four thong braiding. I made my first set of reins for my horse, and never looked back. Over the years I’ve created hundreds of items, especially dog leashes that I sell in my online stores. People are always asking for custom braiding and it is gratifying to hear how happy they are with the lead, key fob or hatband I have made them. 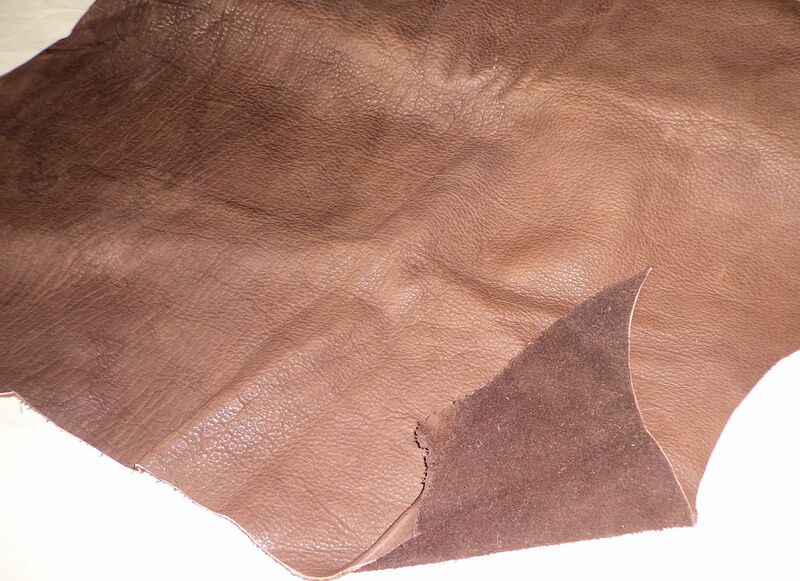 The process of making a dog leash or other hand braided leather piece begins with a superior leather hide. I am lucky to be near a tannery that has a shop with great deals on whole hides and scrap pieces. A full cow hide can cost $100 or more depending on the size, finish, thickness and quality. 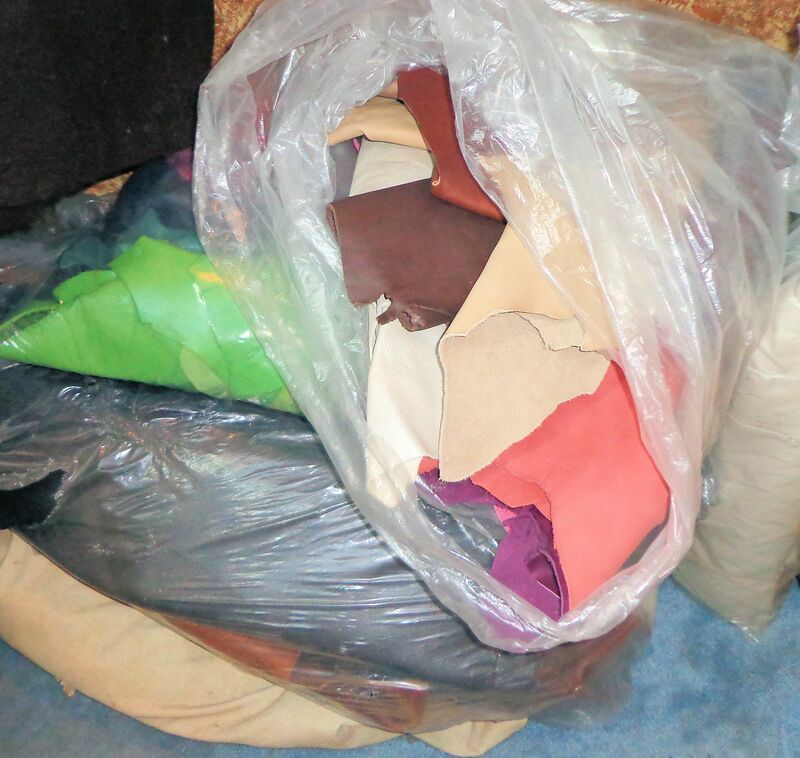 Leather hide is mostly sold by the square foot although scrap can be purchased by the pound. 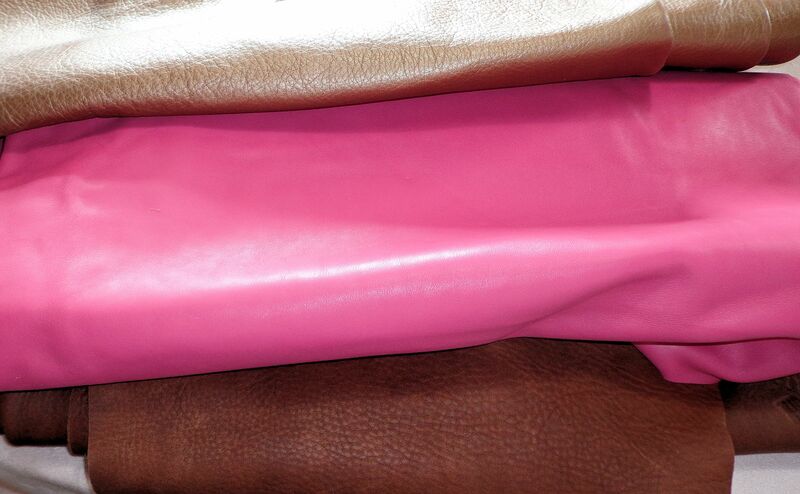 I have a large inventory of fine leather in many colors and thicknesses. There is even some lambskin and bison hide in my stash. Lamb is very thin and fine, great for hatbands and bison is soft, tough leather that I use to form high quality, up-market dog leads. 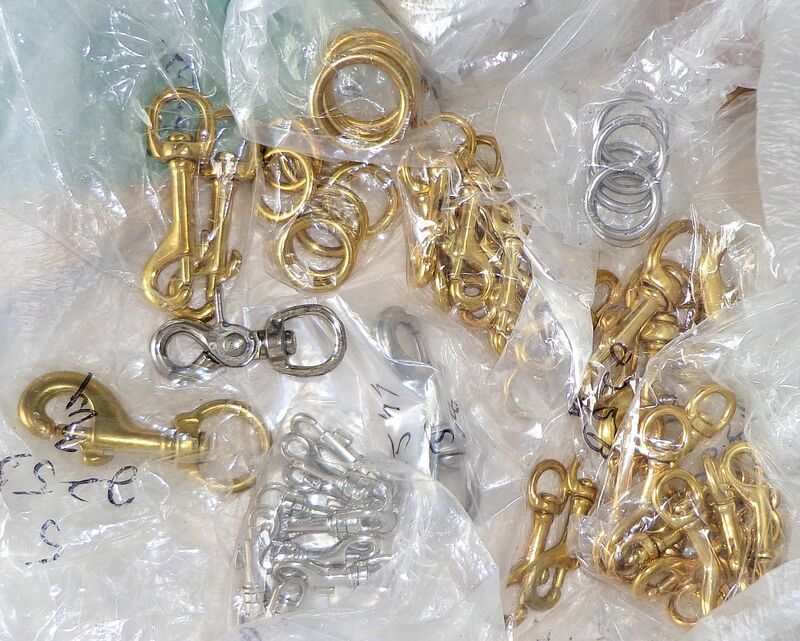 For the metal fittings, I use the best available, solid brass, bronze or stainless steel. Because braided leather will last for years, the metal wears out before the leather. For a long-lived dog lead, set of reins or key fob, cheap zinc or chrome plated base metal will not do. 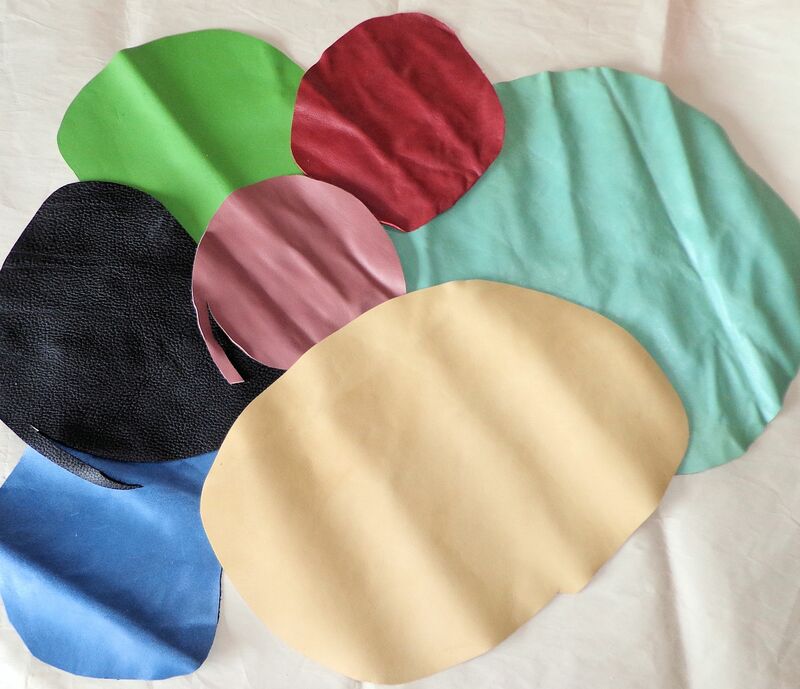 To begin the process of making a dog leash, I select a nice piece of hide, preferably from near the back or side of the animal where the skin has less flex, and I cut a circular panel at least a foot in diameter. Odd-shaped scraps can be used, but getting as close to a circle as possible will result in less waste. I use my strap cutting tool to cut a long, thin, continuous thong of leather. 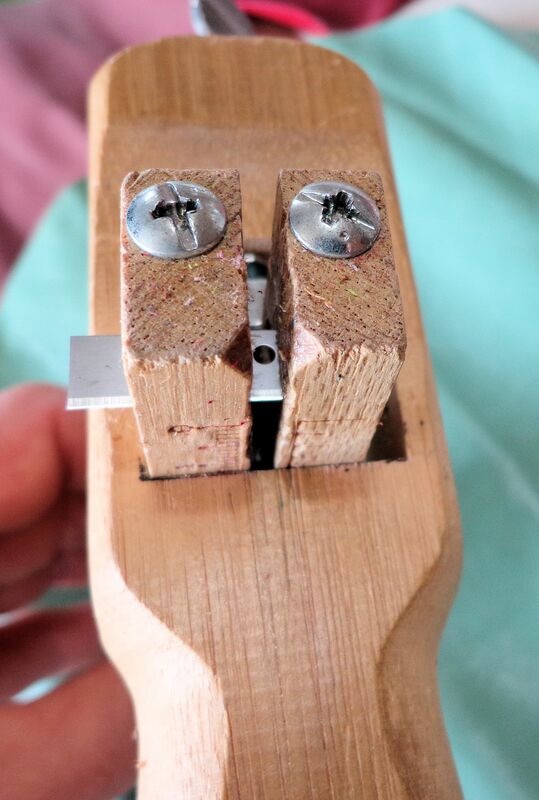 The cut should be on a gentle curve, avoiding sharp corners so the strap will be flat and straight. I trim the thong if there are any rough stringy bits along the edges so it is smooth. Now I have the basic material to make braids. 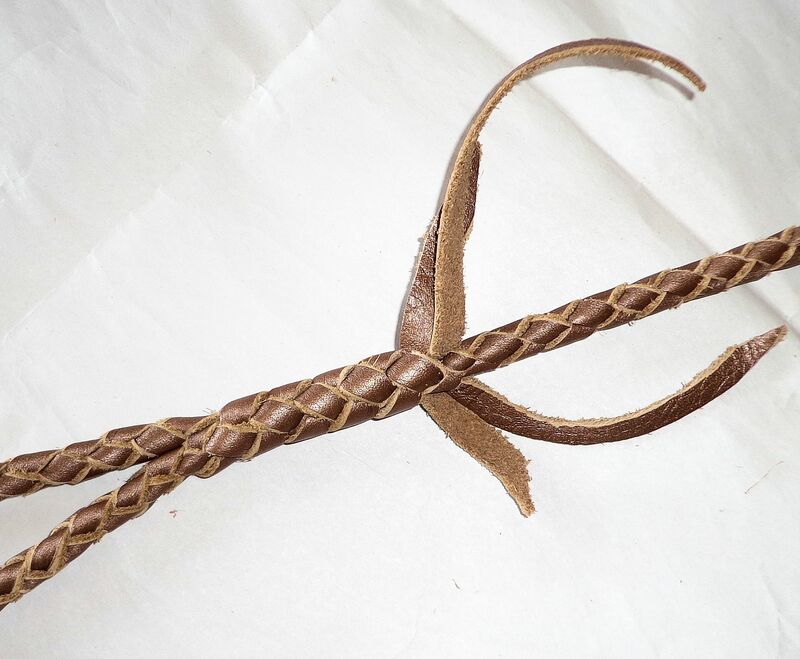 Four thong braids around a metal fitting are done with two strips of leather, a little more than double the length of the final product. To make a lead, the leather is passed through the eye of the bolt snap and pulled until the length is even and the ends meet. The snap is secured to provide a solid anchor for pulling against to create tension. Now there are four thongs in your hand. 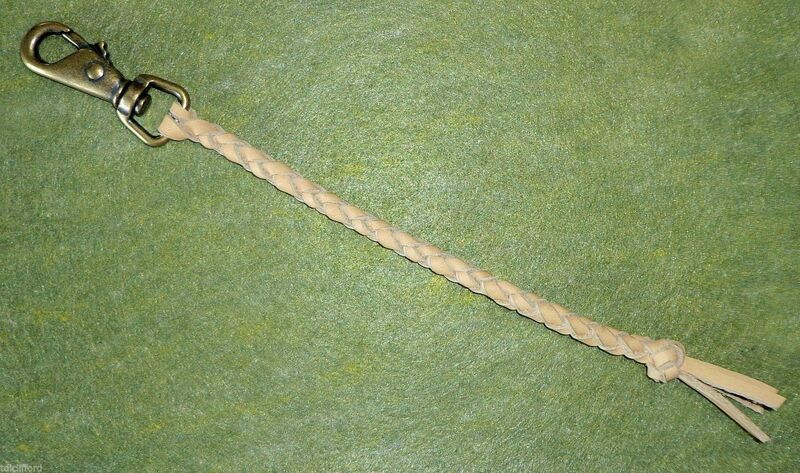 A four-foot-long dog lead with a braided-in handle requires two thongs about 12 feet long. One-quarter of the length is lost during the braiding process as the strips wrap around each other. 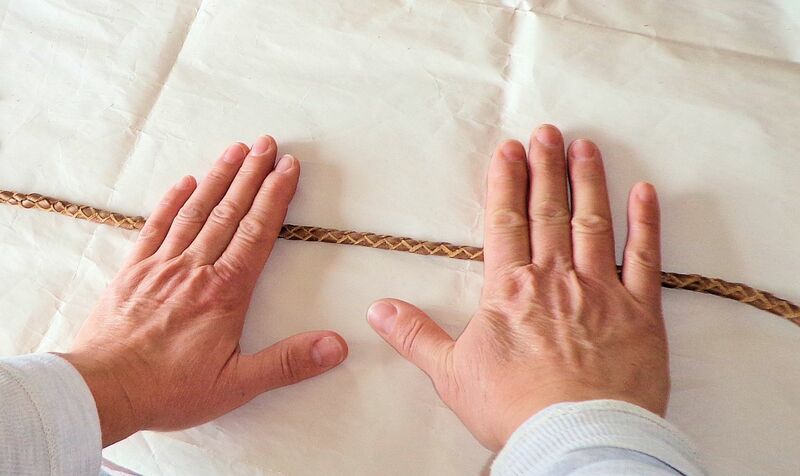 Extra length must be calculated to form the hand loop, including the ends for braiding in to hold the loop from slipping. Braiding four strips instead of the usual three is not very complicated. It requires a little concentration and plenty of hand strength to hold the braid and keep each turn tight. Not enough tension will result in a loose braid. For each turn of the braid, the loose thong highest on the braid is brought around the back and placed between the second and third thong. Care is taken to keep the leather finished side out. The final round braid should be closely woven with no gaps between the thongs. 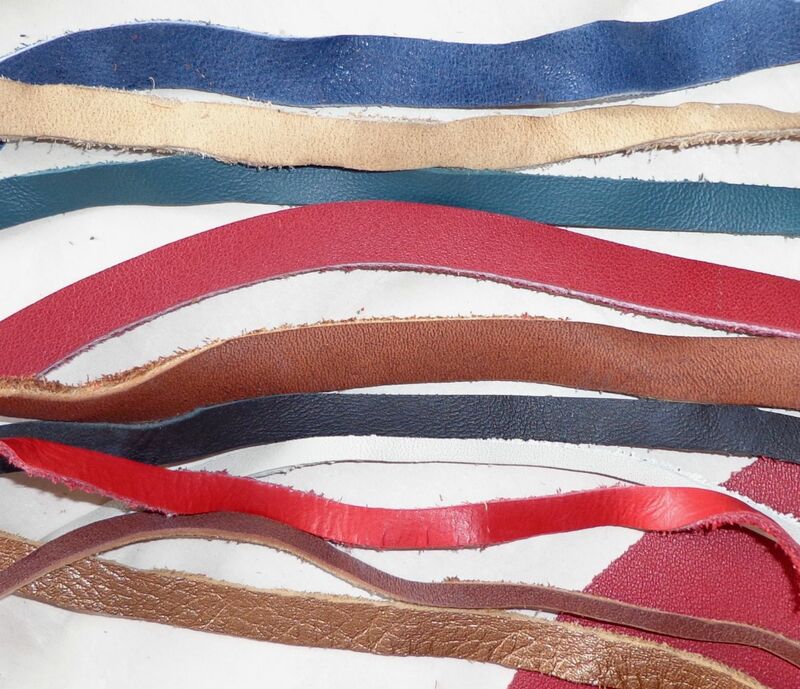 During use, all the thongs work together to hold the strain, effectively quadrupling the strength of the leather. 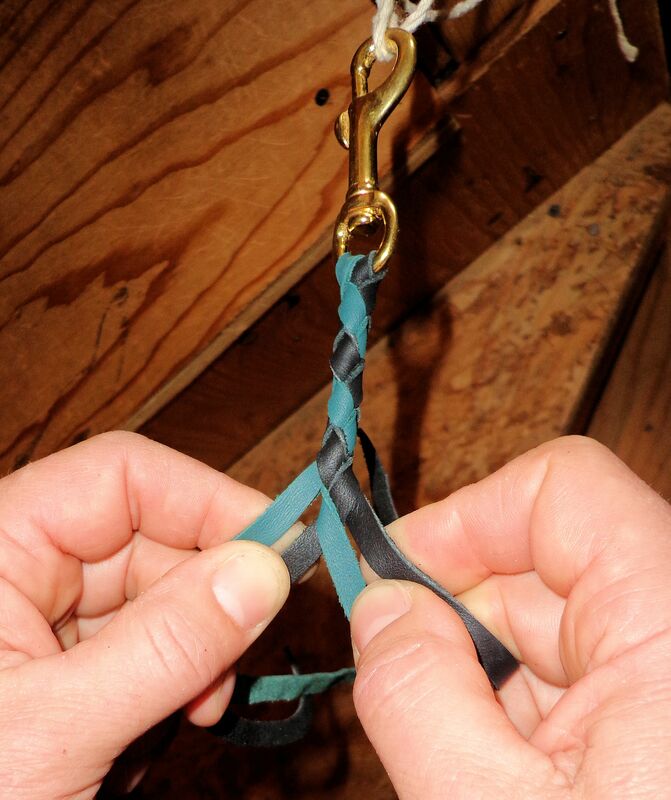 A 1/2″ diameter braid is more than sufficient to form a rein to control a horse. Most dog leads are 1/4″ to 3/8″ in diameter. The diameter of the braid is determined by the width of the thong. 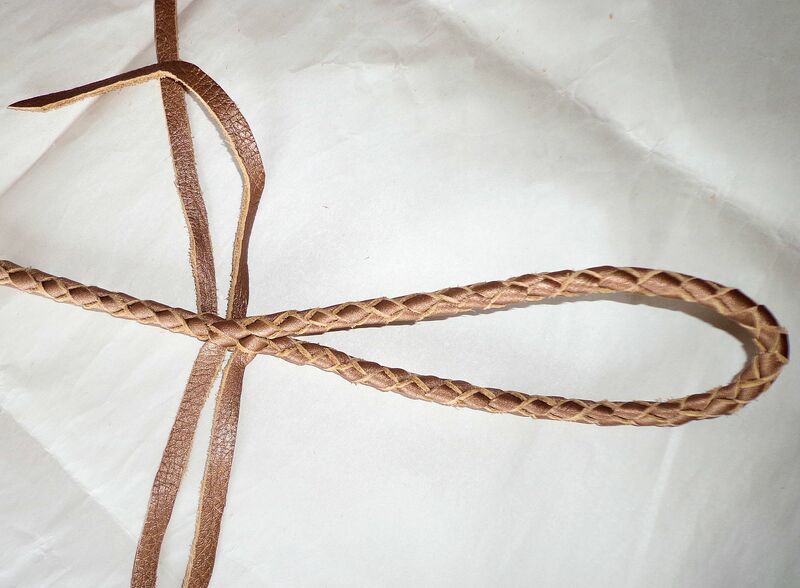 To make 1/2″ diameter braid from a moderately stiff piece of leather 1/16″ thick, with not much stretch, each thong is cut approx. 7/16″ wide. 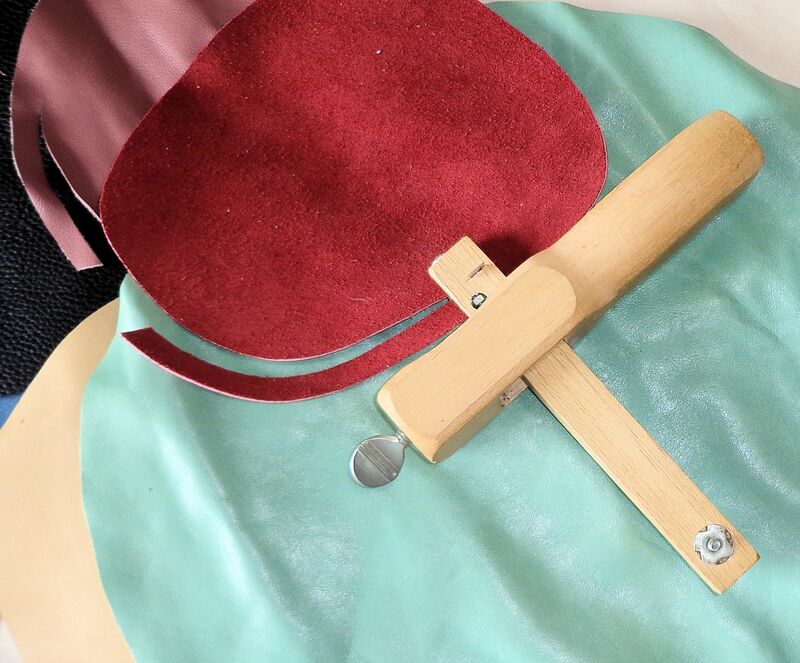 The thickness of the leather is added to the width to equal 1/2″. For very pliable leather, the thong must be cut wider since some width will be lost as the leather stretches during braiding. Once the braid is finished, the ends are temporarily secured to hold them. The braid is then rolled under the hands on a hard surface to seat the thongs and make the braid even and smooth. Then the ends are either knotted or braided in so they do not unravel. 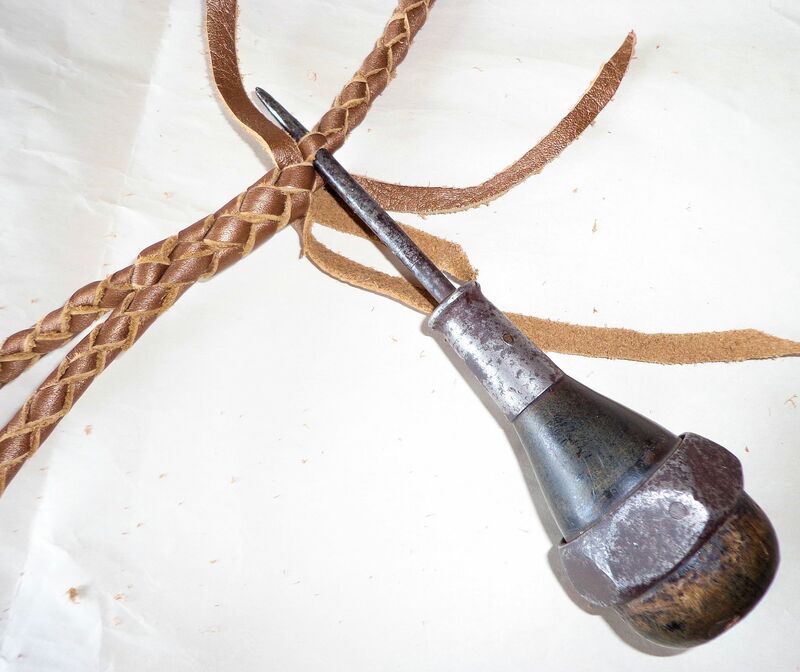 To braid the ends in, a fid leatherworking tool that looks like an awl is used to widen the space between the braids. An end is passed through the space and pulled tight, then the process is repeated until the ends are held and can not slip out. The thongs are cut flush with the braid. I like to secure the ends with a dab of super glue to help hold them. The finished leash is now ready to take some lucky dog for a walk. 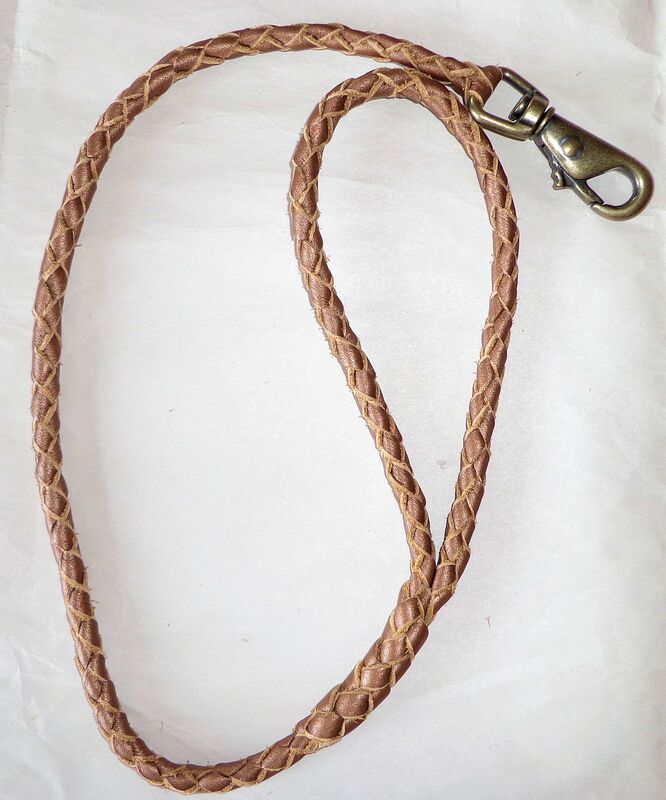 The leash below is bronze leather with a 3/8″ diameter braid and a solid bronze snap. 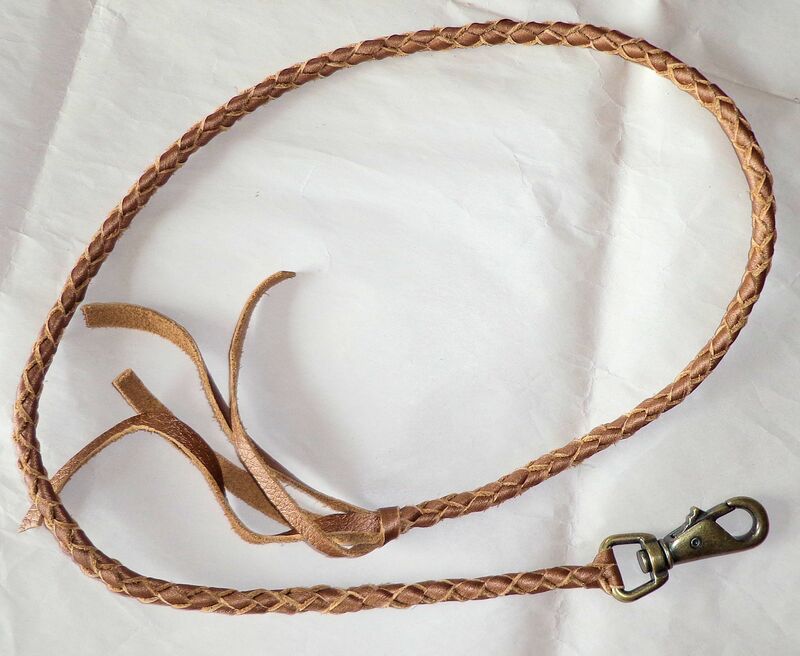 This entry was posted on February 22, 2015, in Crafts, Phoenix Farm Store, The Horses, Uncategorized and tagged braided leather horse reins, braiding leather, four-thong braiding, hand braided leather, hand crafting, leather craft, leather dog leash, leatherworking, self-employment. This sanctuary in the south window is my tiny spot of spring. The wind is howling today, gusting to 30 mph. The jet stream is a constant dull roar overhead. This wind is what’s left of the winter storm named Neptune by the Weather Channel. We were warned it would be a blizzard, but it went out to sea before reaching central Maine and we received only a few inches of snow. But plenty of high winds. The temperature was near 20 F at mid-day, a very chilly proposition with the wind chill. The horses are huddled against the south side of the barn soaking up the sun and sheltering from the wind. Although I can not escape the sound of the wind, the sunlight is strong now, warming the house in the morning and coaxing flowers from my plants. I purchased a hyacinth last week that is still blooming nicely. The scent is heavenly. My cyclamen has several pretty pink flowers and the miniature rose has graced me with three buds. 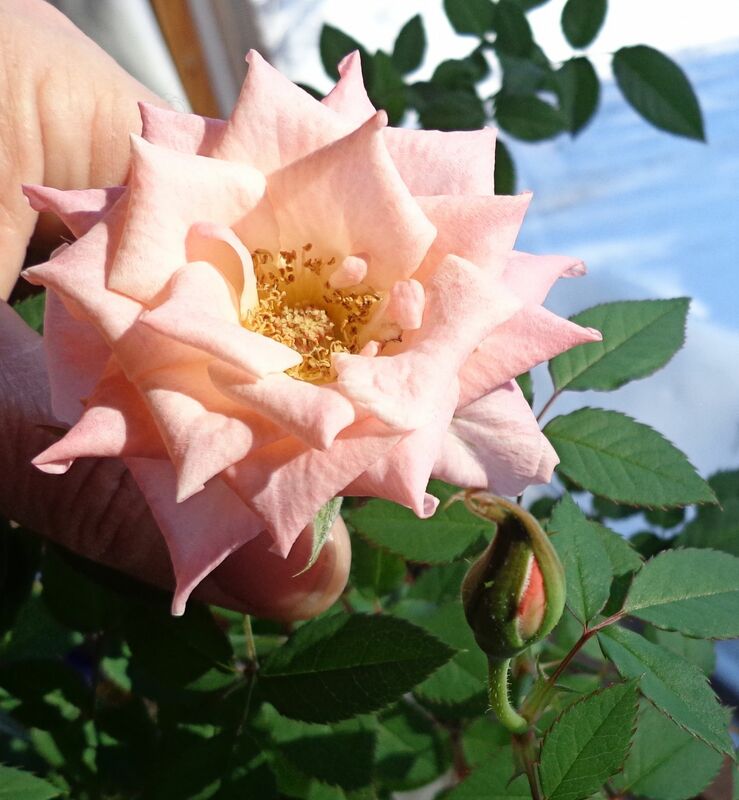 The peach-colored flowers have a strong scent and seem big for a miniature plant. Last month I clipped the branches of the rose back and gave it fertilizer. The new blossoms are my reward. I’m trying very hard to see just the lovely flowers and not the four feet of snow piled outside the window. 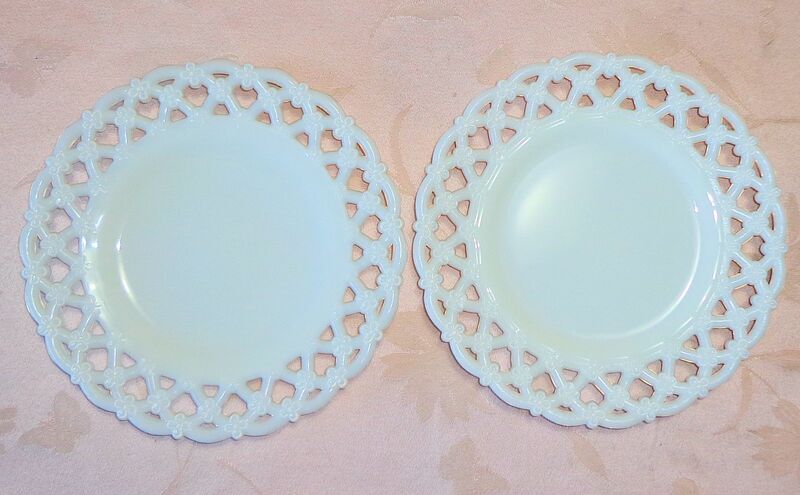 A current listing in the Phoenix Farm online store is this lovely pair of lattice-work milk glass Westmoreland salad or luncheon plates. The plates measure 8.5″ in diameter. 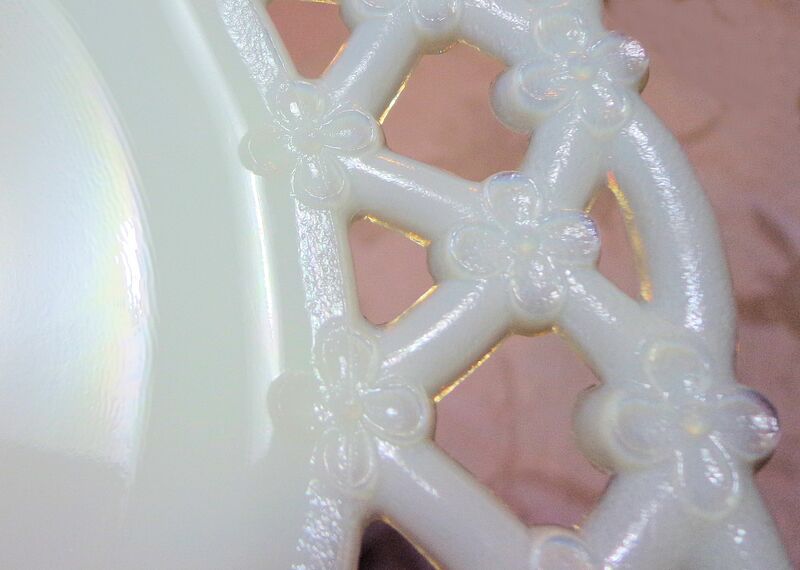 The delicate lace on the rims is decorated with tiny flowers at the intersections. The pattern is called Forget-Me-Not and was produced from the early 1900s through the 1980s. One plate has the WG mark and was made after 1946. The other plate is unmarked and may be older or younger, it is hard to tell for sure since many pieces of Westmoreland production were not marked. Some only carried paper stickers that were easily lost over the years. Westmoreland Glass Company began in 1889 as Westmoreland Specialty Company and was located in Grapeville, PA. The name changed in 1923 with a change in ownership. The factory closed in 1984. Throughout its history Westmoreland was known for high quality glass production. 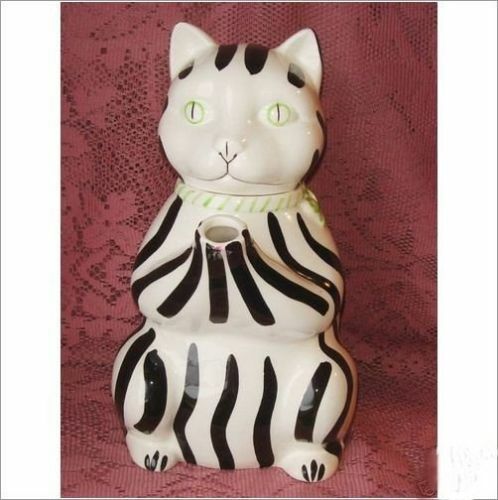 Milk glass was their most common item. Much of the glass was hand painted, especially before the 1940s. 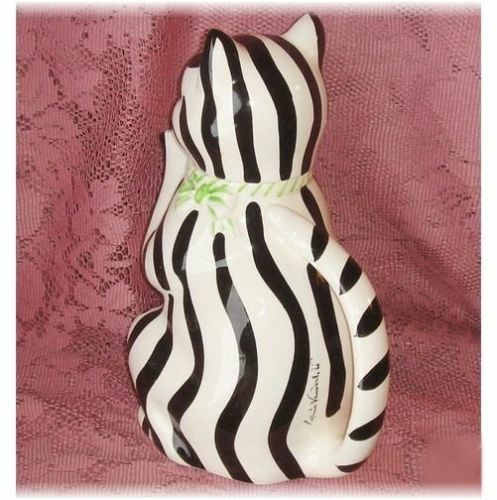 Beautiful examples of handpainted Westmoreland glass can command high prices. These Forget-Me-Not plates are sometimes found with a painted central design of wild pink roses, or with the flowers picked out in a bronze color. The paint was applied cold, a process with often unstable results. However, of the pieces I’ve seen, the designs generally appear to wear well with minimal paint loss. This entry was posted on February 12, 2015, in Phoenix Farm Store, Vintage and Antique and tagged Depression glass, hand painted glass, milk glass, opaque white glass, vintage glassware, Westmoreland Forget-Me-Not, Westmoreland glass. 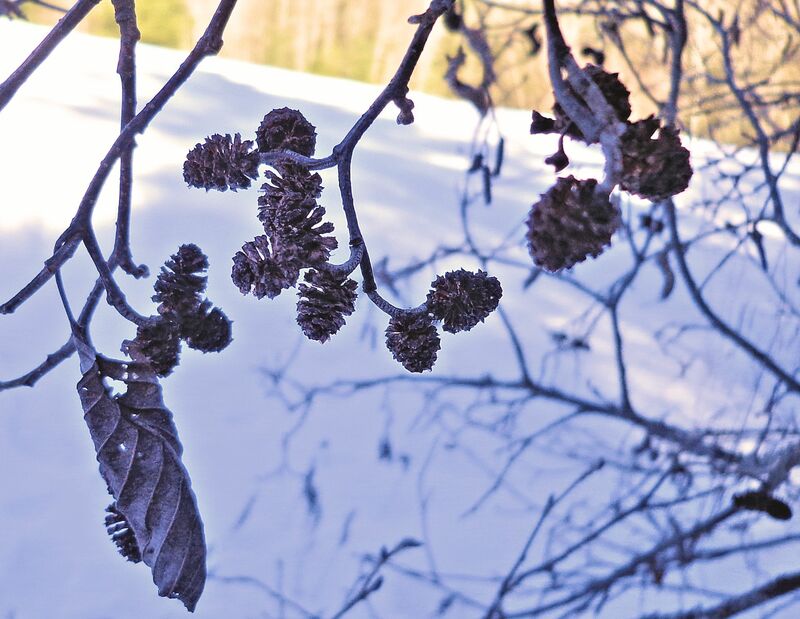 The Speckled or Gray Alder (Alnus incana rugosa) is a common wetland small tree or large shrub here in Maine. It usually occurs in moist soils though it can grow in nearly any location. Most often the plant is seen as a series of small trunks about 4″ to 7″ in diameter arising from a common root system and growing 10 to 15 feet high. The trees can grow singly and become taller, to 30 ft. It is named speckled for the many light-colored gas exchange pores in the bark called lenticels. The alder figures in the life stages of the woolly aphid, an insect I discussed earlier in this blog. 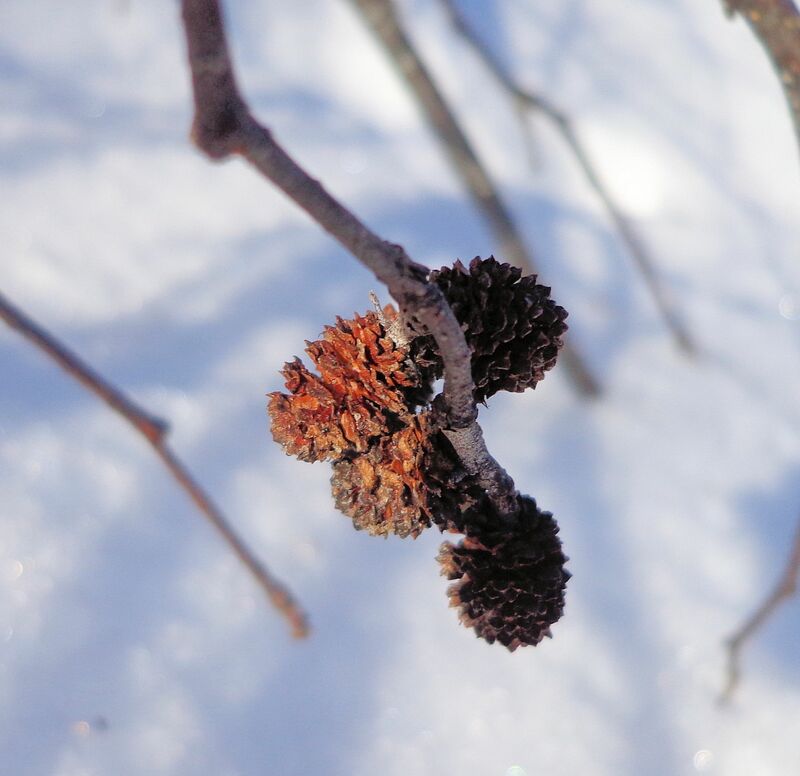 Beyond the use to woolly aphids, the alder is valuable to the environment as a pioneering shrub in disturbed areas, for erosion control along waterways, and for its ability to fix nitrogen in the soil. 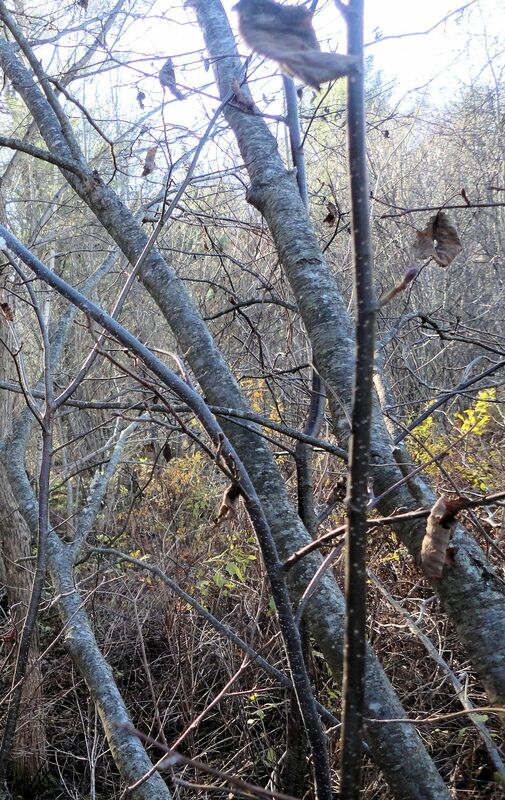 Because alder withstands having its roots flooded, it is often found along the very edges of streams. Here it helps hold the soil to maintain stream banks. After a fire or man-induced destruction of tree land, alder is among the earliest volunteers, helping to hold the soil and provide habitat for wildlife. Many songbirds eat the alder’s seeds and the leaves and twigs are browse for herbivores. Butterfly caterpillars also feed on the leaves. Thanks to a symbiotic relationship with actinomycete soil bacteria, alder form large root nodules, sometimes as big as a human fist, filled with bacteria that acquire nitrogen from the soil and make it available to the plant. The alder feeds the bacteria with the sugars it produces by photosynthesis. This nitrogen fixing activity enriches the soil in that area for other plants much as legumes do in hayfields and gardens. Because it is punky, the wood of speckled alders has no real use for humans beyond it’s humus forming value. But the catkins of the shrub are often used. The male catkins are long and narrow and female catkins are shaped very much like tiny conifer cones, especially pine cones. The male catkins are visible in the background of the first photo above. The female catkins are woody and tough. Being 1/2″ long or smaller, the tiny cones are desirable for many purposes including jewelry making, decorative crafts and potpourri. They contain large amounts of fine seeds that are usually shaken free before the catkins are used in crafts. These miniature cones are often fashioned whole into earrings and pendants. A mold can also be created using a cone which is then burned away. 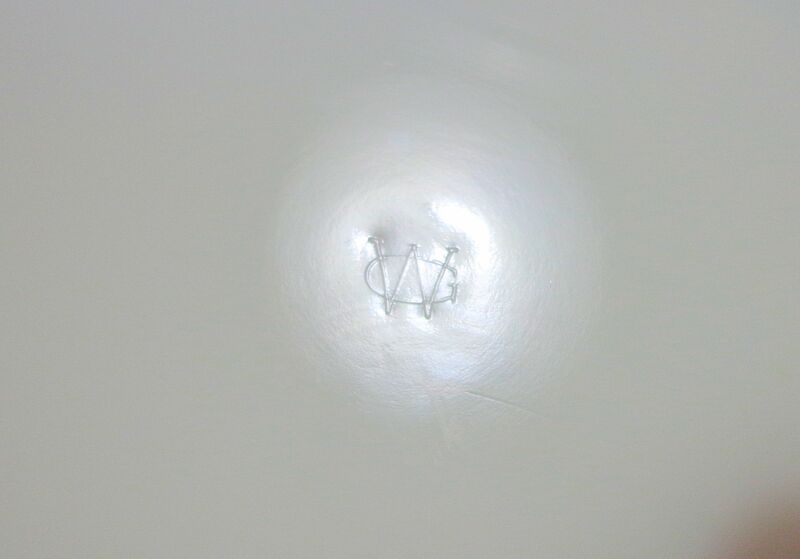 The resulting mold cavity is filled with silver or gold to produce solid metal jewelry. 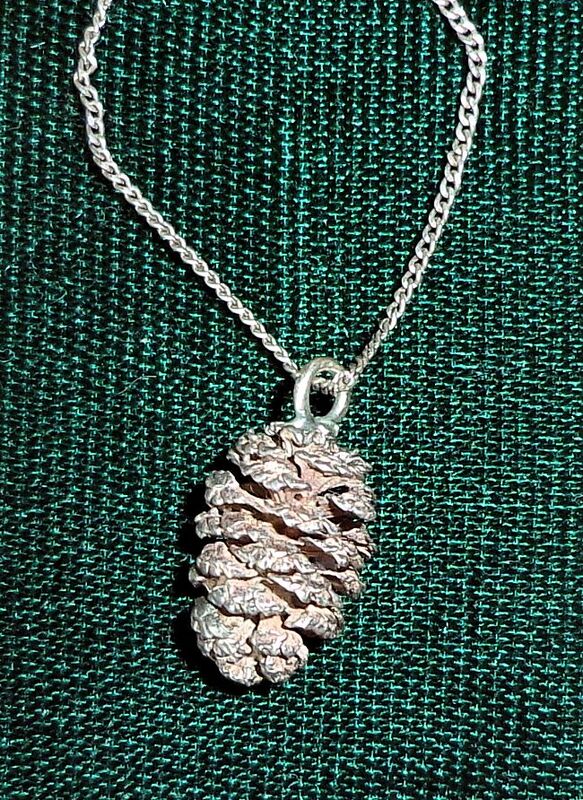 I have a lovely little solid sterling “pine cone” pendant given to me by my husband. In winter I collect the female catkins for sale in my online stores. These popular craft supplies are another product helping provide cash flow for the farm. 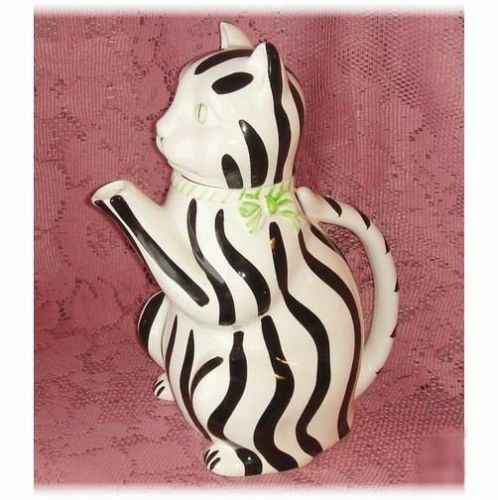 An offering in my eBay store, and something I picked up as part of a lot at an auction in Maine, is this funny striped cat teapot. Marked Gloria Vanderbilt and Tastesetter by Sigma, it is from the 1970s. The piece is in very nice condition with a few minor chips, no cracks or crazing. A similar teapot sold a few years ago for about $70. The current price is in the $15-$30 range. Sigma was an import company that started the Tastesetter line to appeal to an upscale sort of consumer. 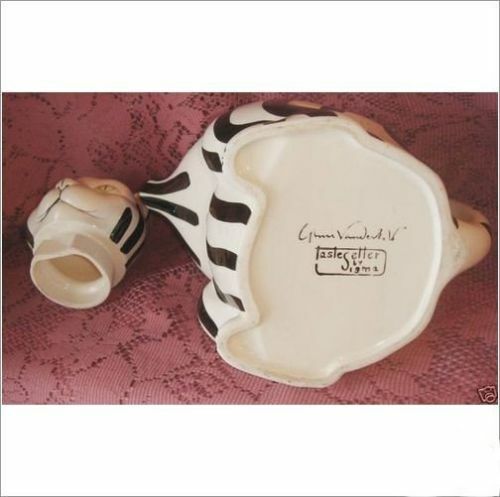 In the 1970s, before Gloria Vanderbilt became famous for her designer jeans, she collaborated with Sigma to produce a line of interesting housewares including this teapot. 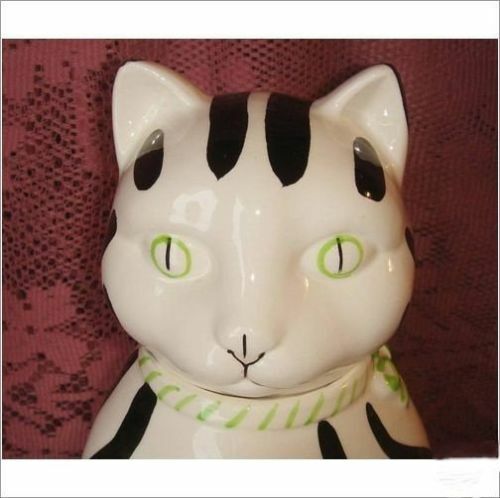 There is a set of accessories for the pot, green (to match the cat’s bow) creamer and sugar bowl shaped like yarn and a teaball in a mouse shape. In the late 1970s Gloria became famous as the first to create designer jeans with her name on them. She made millions. Her psychiatrist and attorney colluded to defraud her. The psychiatrist convinced her to change lawyers. The doctor and lawyer worked together to mislead her into signing over various aspects of her business interests, bilking her as they went along. She trusted the doctor, a childhood friend, and gave her lawyer power of attorney. He even sold all rights to her own signature. She finally discovered the fraud, sued and won, but during the time of the lawsuit the lawyer died. The monetary reward was never collected. The lawyer also failed to remit her taxes and she was forced to sell two homes to pay what she owed the IRS. Gloria now uses a logo-like G superimposed on a V to sign her artwork. Losing one’s own signature is a deep, personal affront. Especially for an artist. Items with Gloria’s name on them, bearing no relationship to her, can still be found today. It is a moral offense that should never have been allowed to stand. The signature mark on this teapot is authentic, made when she still controlled her own name. Yet, despite the fraud and loss, Gloria does well. She is believed to be worth about $200 million, most earned by herself. Her artwork is admired and featured in galleries. She has written several books and has contributed to various fashion magazines as an authority on design and style. I would say she got her revenge on those who defrauded her.